Come and experience our new Comforts of Home &reg Bedding Collection.The Candlewood Suites Hotel - Greensboro is an ideal choice for both business and leisure travelers. Each room has a fully equipped kitchen complete with a full-size refrigerator/ice maker, microwave, range, and dishwasher. Traveling on business&reg Bring your laptop and work efficiently at your executive desk. Communication is no problem with voicemail, free local calls, free high speed Internet access and two separate phone lines. Borrow your favorite movie or music from the hotel library and enjoy in your room from the comfort of your recliner. Hungry&reg Visit the Candlewood Cupboard, our on-site convenience store, and charge it to your room. Work off some stress in our 24-hour Fitness Center. Staying a long time&reg Take advantage of our on-site complimentary laundry facility. We&regre a pet friendly hotel too (fees apply). We are located just 4 miles south of the Piedmont Triad International Airport in the Deep River Office area. Oak Hollow Mall, Four Seasons Mall, Celebration Station, The Greensboro Coliseum Complex and a wide variety of restaurants are just minutes away. 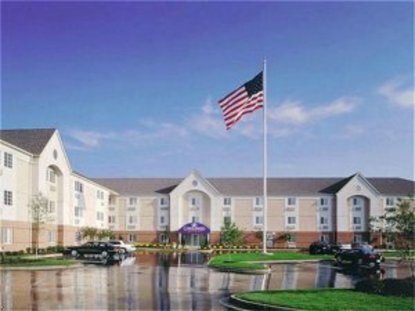 Conveniently located close to Castle McCulloch, Emerald Point and local companies including: RF Micro Devices, Federal Express, Volvo, Gilbarco, and many others This hotel is committed to providing accessible facilities under the American Disabilities Act. If your accessibility needs are not met, please contact the Hotel Manager on Duty. Should you require additional information regarding accessible facilities for guests with disabilities, please call 1-800-Holiday (U.S. and Canada) or contact the hotel directly. For the hearing impaired, TDD service is available at 1-800-238-5544 within the U.S. and Canada.